Hello dolls! 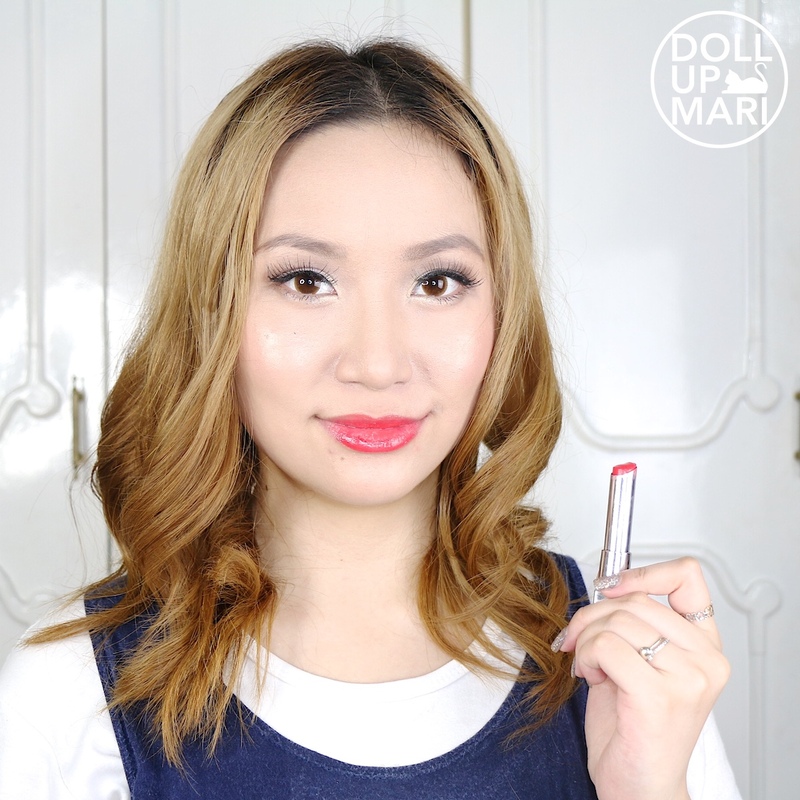 This is my review for Maybelline's Lip Flush Sheer Healthy Lip Color in RD01, or Red 1. 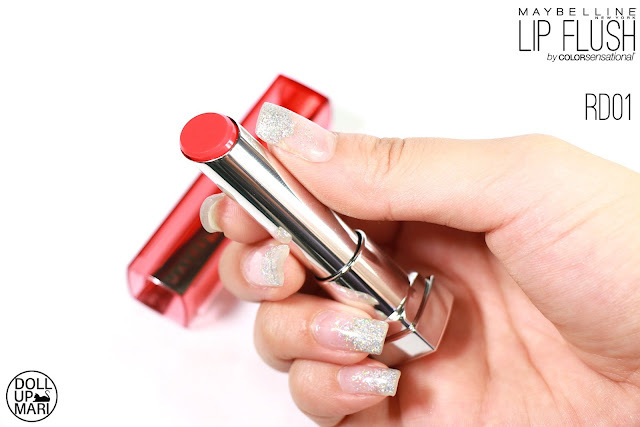 Maybelline Lip Flush Healthy Sheer Lip Color is Maybelline's newest offering, it's a lot like what is called "melting balm" in the Korean beauty world today. Like a melting balm, it "melts" into the lips and fits in right in place for comfortable wear, nourishes the lips, and of course, makes the wearer happy as it's watermelon scented. 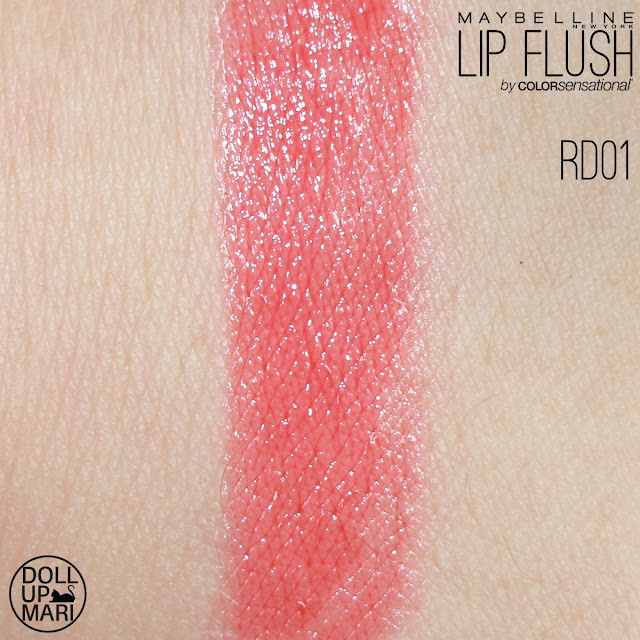 It's got a sheer coverage, shiny finish, and gives a healthy flush of color, hence the name. Aside from this shade are seven other shades, featuring reds, pinks, a coral one, and an orange one. This is how it looks like when it's still sealed. 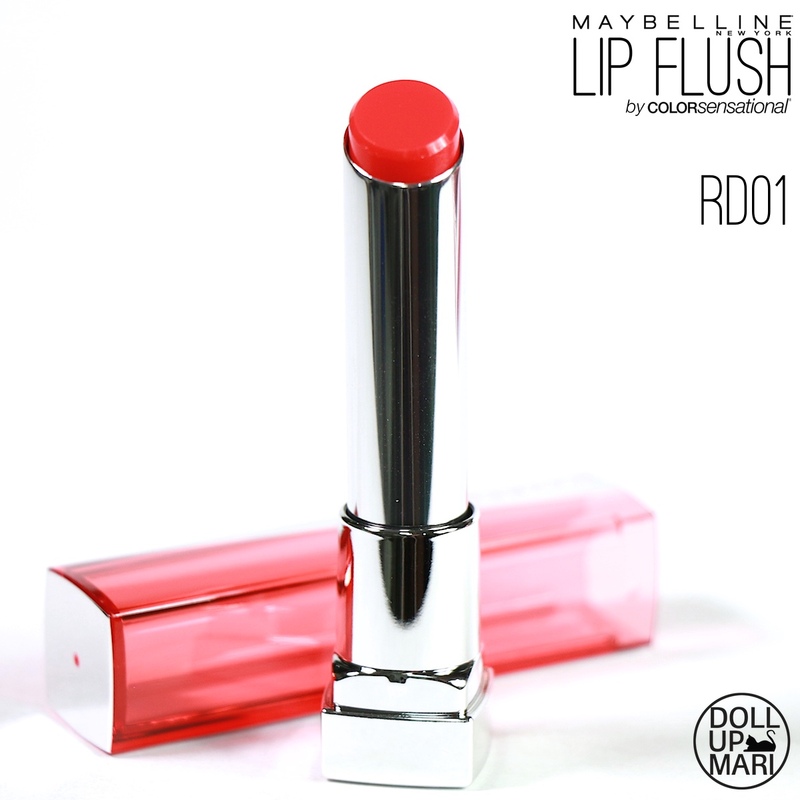 It's thinner and sleeker than the usual Maybelline lipsticks. This has its own shiny cathedral window kind of lid. unlike the matte covers they have for their matte lipsticks. 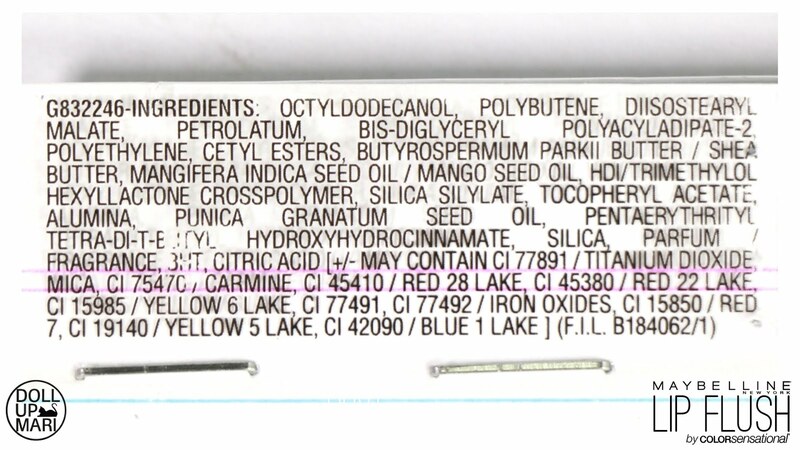 For the interested folks, here are the ingredients. This is how the bottom of this tube looks like. I don't know whether it's a good thing or not, but these shades simply have the code of the color and then the number. No fancy names for these. This is how the product basically looks like without the lid. This has a slanted metal case, so it's not really meant to feel like a lipstick that is meant to be hoisted up in the case in each usage. This is how the shade looks like up close. Red 1 is basically your neutral, no-undertone red. It looks a little bit orange at the first glance, but in real life, it's not. There's CO01 which is the red with orange touches. This also has no blue undertones because it's RD02 that has that. This one is really a neutral red. This is how it looks like. 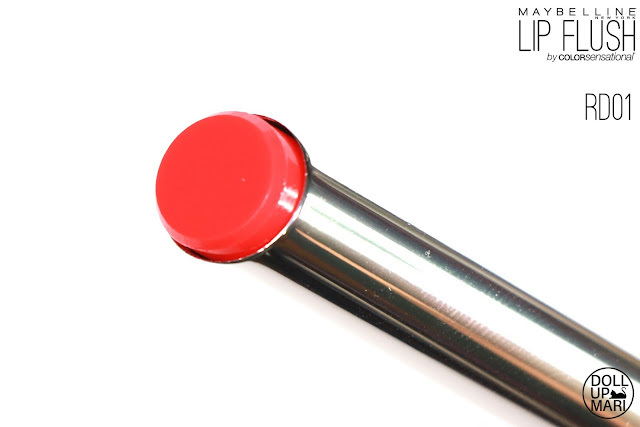 The product itself is more or less at the same length as a typical Maybelline lipstick, but what's different is that this is sleeker at more or less 1cm diameter (compared to the usual 2.5cm-ish diameter of lipstick cases). The stick is at 1 inch, more or less, so overall this is just 3g of product versus the usual 3.9g for Maybelline lipsticks. 0.9g may not seem so much, but when you start to think that 3.0 to 3.9 makes it go from 1 to 1.5cm in diameter and 1 to 1.5inches in length, that's when it starts to sink in. This is how the swatch looks like. It goes on sheer, and it really goes on shiny. 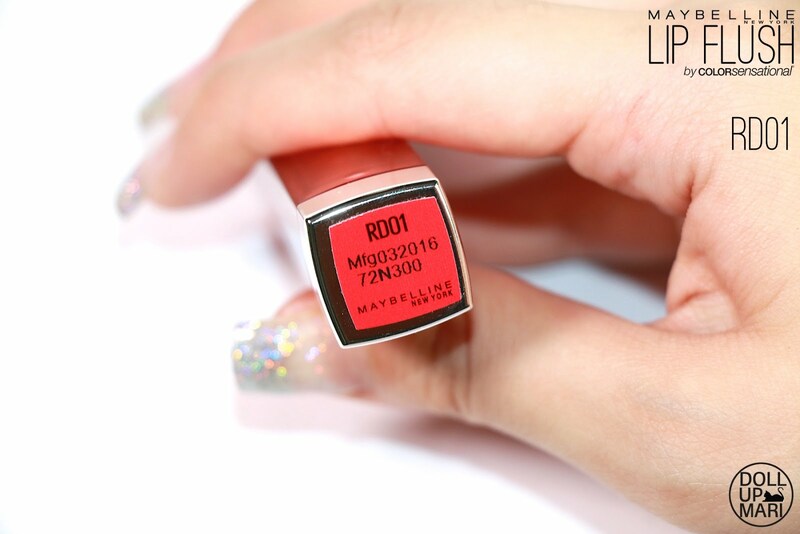 This was never meant to be matte nor opaque. It generally builds on whatever "background" it has, so this will also look a little bit different once it's already on the lips as it will, by then, be building on the pinkness on the lips. On the lips, it looks a lot like what brands would call strawberry or cherry flavored lip balm. It's a neutral red, and it kinda helps that my lips are pale in general so the change isn't so great. It's a crisp, vibrant color. On me, it looks like I'm wearing a dark pink lip gloss, or perhaps a red gloss. It definitely doesn't look like lipstick, and it is more sophisticated than just wearing lip balm. Packaging: Each one comes in a shiny silver case with a red cathedral window lid. This may make it a little difficult to know each shade at a glance as the window is red. In terms of size though, it's sleek and easy to carry around. Shade Selection: This is one out of eight shades, with the whole collection having two reds, four pinks, one coral one and one orange one. I am a pink girl through and through and you dolls know that so well, so for me this collection having four shades of pink is the best way to go. I feel that the vibrant color spectrum of shades that Koreans usually use for melting balms are well represented here, as these are the colors that they would also turn into lip tints. The concept of this collection is very Asian, so in an Asian perspective this is the right spectrum. But I guess, given the Western world's addiction to mauve and brown right now, there's nothing in this collection for that and you will still have to bear with liquid lipsticks to get a brown shade. One other thing I'd like to note, though, is that I like how they have a lot of sheer creamy shades as with the pinks. Most colored lip balms are purely transparent, so I like that they have more sophisticated offerings with the creamy ones. Color Payoff: I think that this has good color payoff for a melting balm because you kind of have to realize that this goes on sheer and goes on shiny. The fact that all these shades can be discernibly different despite going on sheer shows that the undertones of each shade really show up, which is why I think this has a good payoff. 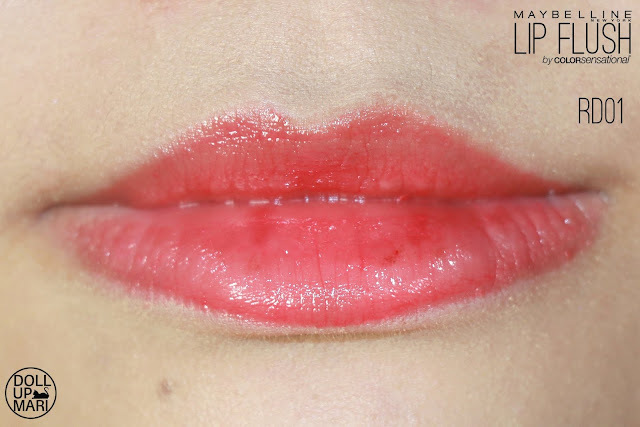 I also like that while it's sheer, you can actually pile this on to make the color more intense, or put this on very thinly for a no lipstick #MyLipsButBetter look. The color is very buildable. It's also worth mentioning that I'm amazed with how my look can easily change just by shifting shades within this collection. Texture: This has a smooth, emollient texture that glides on easily. It feels smooth to the touch, and when you try to smack your lips it does not feel sticky whatsoever. When it is drying up it of course glides less and less easily, but it's still smooth. 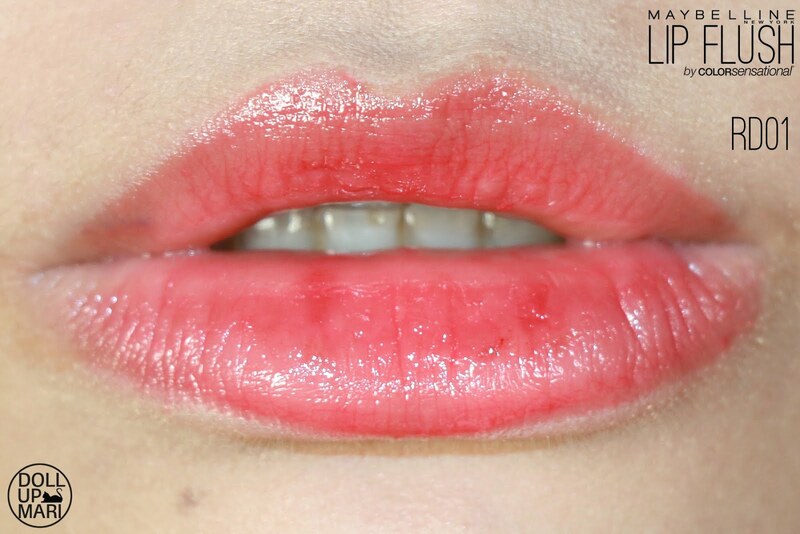 It doesn't have that sensation wherein when a lip product is drying and it starts to powder and flake up. 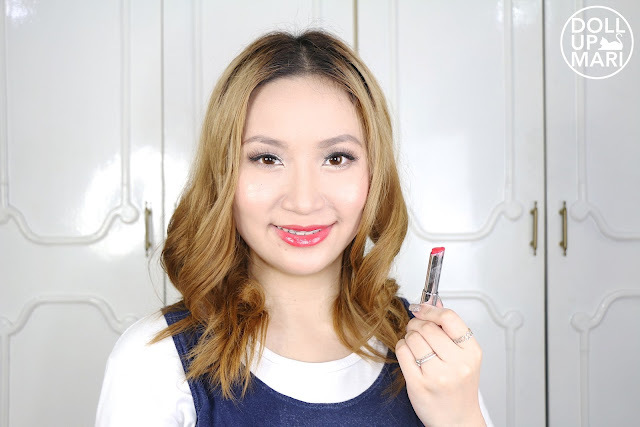 Comfort: In relation to texture, this is a very very comfortable product, and I super love this because there are many shades that look so sophisticated that I can get away with wearing technically lip balm to a lot of occasions now. Continuous use has helped to make my chapped lips less dry (though still dry hahaha), but for someone like me with extremely dry lips, this is already OK.
Longevity: A lot of people are asking as to how long this lasts on the lips. So this behaves a lot like a lip balm and dries up as fast as one, so you'd need to reapply every 2-3 hours, or more often if you have drier lips. In this collection, not all shades leave tints on the lips. 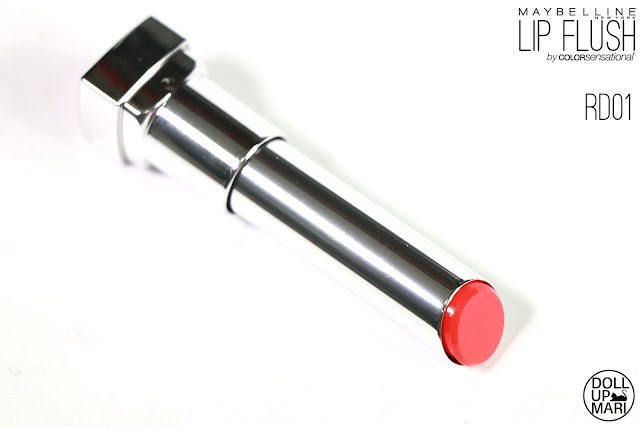 The red ones, the coral one, and the orange one, all leave subtle tints akin to using lip tint. But since the pink ones are also creamy, they don't leave that much of a tint, but they help to improve to make the lips rosier. 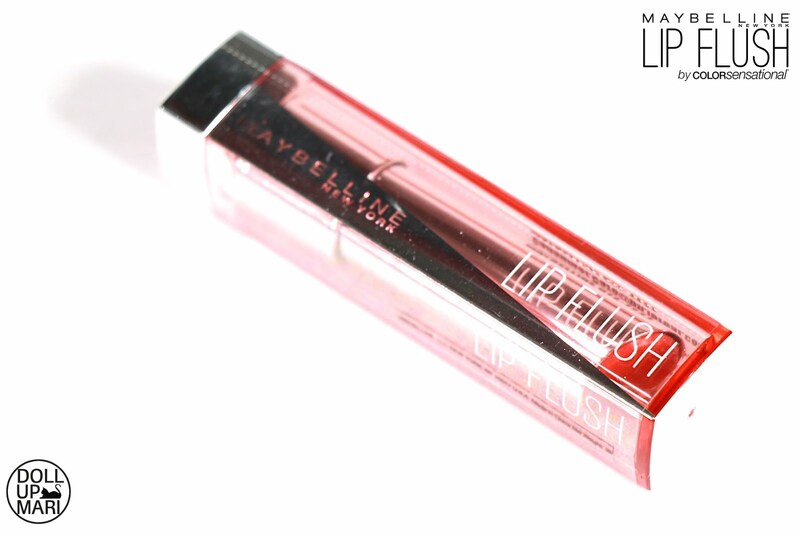 Value for Money: Each one only costs Php229 in Maybelline counters nationwide! This more or less comes in a 1 inch stick with a 1cm diameter, which, based on my experience for similarly sized products, can last for about two to three months with frequent daily usage (i,e.3-4 times a day), but can extend for even longer if you don't use it very often. I think it's very affordable, more so this is the only balm collection where I can get cute shades. Overall Verdict: I loooooove this collection overall. Having extremely chapped lips in the middle of the matte/liquid lipstick/powdery lipstick trend is not an easy situation to be in. A lot of the current selections of lip products are too dry for people like me, so this collection is a godsend. I really liked a lot of the shades in this collection and I really see myself repurchasing shades in the near future.